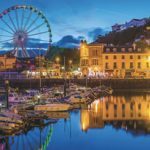 The official English Riviera image library managed by the English Riviera BID Company, houses a large collection of copy right free images available exclusively for ERBID partners to use in their own promotions both online and offline FREE OF CHARGE. To use the library, you need to visit the site http://rivieraphotos.co.uk and Create an Account (see top right) of home page. Your request will be received by the ERBID Executive Team who will respond with your log in details ASAP. We hope that you find this new resource helpful.